From vehicle graphics to point of sale materials, we’ve got it covered! Large format graphics can be used in almost any situation or environment. Being much more than a just a large format print house, we work with clients to develop and create truly unique solutions that will inspire and engage intended audiences. Our range of services and print capabilities reflects our clients diverse requirements and are not just limited to those below. If you’ve got a project that you think you might need large graphics for, you’ll probably find we’ve done something similar before. So get in touch with the team and we’ll be more than happy to advise, guide and support you through the project. Engaging Point of Sale materials can make a big impact with your audiences. Through our years of retail experience, Format Graphics have created highly durable and impactful PoS materials ranging from leaflets, display stands, shelf wobblers/barkers, through to hanging banners, floor graphics and window vinyls. Using the latest large format printers and fabrication technologies and tools, we also produce backlit prints, magnetic prints, steel paper prints, price tickets, transparencies, backdrops, direct to media print (DTM), window graphics, displays and promotional items. From design to installation, we can fully project manage your large format print jobs, from design through to installation, we can implement your creations in locations worldwide. Exhibitions and events are the places where you will want to showcase your business and products at the highest level. At Format Graphics, we have a wealth of experience in designing, printing and producing, installing and dismantling exhibition and events stands. Our exhibition and events services range from producing single posters through to complete exhibition stands. Over the years we’ve worked with a wide variety of local, national and international brands to produce full display systems, modular systems, shell schemes, hanging banners, vinyl graphics, signage, banner stands, cladding and much more. When it comes to exhibitions and events, we can provide our clients with a full exhibition solution and are happy to advise and guide you to create stands and materials that will make you the showstoppers. Our team will also install on site and ensure that the build is completed to exact specifications and is ready for your guests. Using the latest in dye sublimation technology, our Fabric Printing Service allows us to print directly to textiles up to 3.2 metres wide and comes in a range of finishing options. Large format dye sublimation can be used to produce silicon edge graphics (SEG), indoor and outdoor signage, feather flags, pop ups, freestanding seamless displays and more. Soft signage is incredibly lightweight and prints can be folded for transport. The range of materials available is vast, giving you a choice of fabrics ranging from stunning silk, backlit and blackout for retail and exhibition through to flag, canvas and upholsteries. Whether it’s the launch of a new product or a local event, Format Graphics have been involved in designing and producing event branding for some of the world’s largest brands. From signage, banners, exhibition stands, wall panels, interactive displays and promotional give-aways through to pre-event materials, such as engaging invites, we’ll produce graphics that will bring your event to life through tangible high quality materials that make a great impact. Our team are also on hand to work with you, to understand exactly what your event aims and objectives are, where the touchpoints and interactions will take place with your guests and advise and guide solutions tailor made for your event. We specialise in producing large format graphics to be used in a variety of environments. Whether you’re looking for short-term graphics to shield in-store refits or a company wanting to use engaging graphics to decorate your office environments we’ll have a solution for you. Our large format indoor graphics solutions vary from window graphics that create privacy, reception/welcome area graphics, large photo and canvas printing and interior signage and display systems. 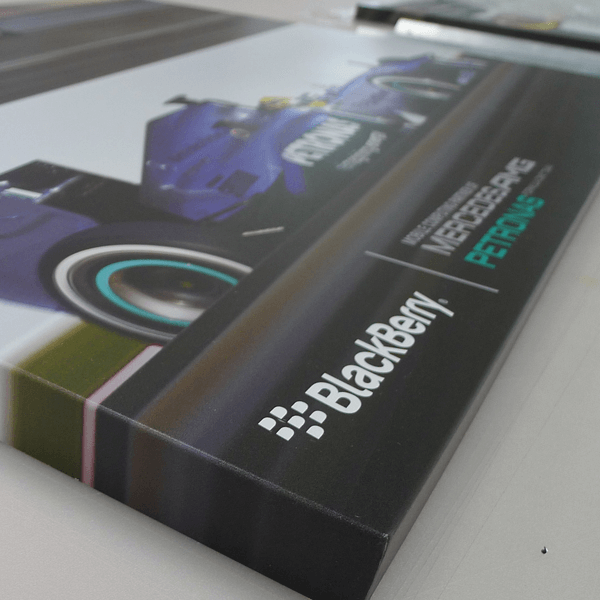 At Format Graphics we use Direct to Media printing which opens a world of different materials we can use. Whether its large outdoor building signage or indoor signs we’ve got a wealth of experience in creating signage that will make an impact. We can print to any surface – wood, glass, steel, plastic, acrylic, dybond, aluminium – and supply full hanging kits and wire kits for installation – we’ll even come and carry out the installation for you! Museums and galleries are places that tell stories and captivate audiences. At Format Graphics we use the latest large format printing technology and highest quality materials that are extremely durable to help bring those stories to life. From directional signage, captions, back drops, through to interactive panels and displays our solutions are extremely durable and perfect for museums and galleries.